I've already described the anatomical and biological differences which mean that, despite appearances to the contrary, peccaries are not pigs. I've also described all the various living species of the pig family, which means that it's now time to do the same for the living species of the peccary family. 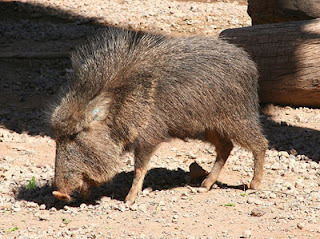 The peccary family is, however, a lot smaller than the pig family: it contains just three living species. The one that's likely most familiar to readers of this blog is also the most widespread: the collared peccary (Pecari tajacu). It's so-named because of the thin 'collar' of whitish hair that runs from its shoulders across the throat, although, in practice, this isn't always as visible as it might be. The animal is found through pretty much the whole of central and northern South America east of the Andes, through most of Central America, coastal (but not central) regions of Mexico, and into neighbouring parts of the USA, where it can be seen in Arizona, New Mexico, and Texas. If a distinction is needed, this is the true "javelina", since it's the one that's common where that alternative word for "peccary" is most commonly used. The first thing you might notice about this range is that it's hardly a consistent habitat. Indeed, even by the standards of pig-like animals, the collared peccary is clearly very adaptable. In the depths of the Amazon jungle, rainfall can exceed two metres per year, and the vegetation is incredibly lush. But neither of these things are true of, say, Arizona. Come to that, while it might sound as if the animal must at least like the warmth, deserts actually get very cold at night, and winter temperatures regularly reach freezing point at the southern end of its range, in the Pantanal savanna of northern Argentina. Collared peccaries also live in the mountains to at least 1,500 metres (5,000 feet) elevation, and probably a fair bit higher in some places. Given this, it's perhaps unsurprising that it has been questioned whether the collared peccary really is just a single species. Anything up to seventeen subspecies are recognised, although mostly on the basis of what is (by modern standards) fairly flimsy evidence. The only detailed genetic analysis that has been done found that the jungle/savanna dwelling collared peccaries of the south are detectably different from the scrubland/desert dwelling ones of the north. This is partly due to apparent differences in the basic arrangement of the chromosomes, which, if true, implies that the two types might have difficulty cross-breeding. If that's true, then it would be hard to argue that they aren't different species, but nobody seems to have done the tests. Like pigs, collared peccaries are true omnivores. They'll eat just about any edible plant parts they can find, including roots and tubers that they can dig up from the ground, and also any small animals that they can find. Despite the latter, the effect they have on churning up nutrients in leaf litter, let alone on seed dispersal, apparently means that animals such as small frogs are actually more common where they live, benefiting more from the available food and shelter than they risk in being eaten themselves. As for the plants, what those are naturally depends on where they live - tropical fruits and seeds are most common in the Amazon, while prickly pear cactus is a popular source of both food and water in the desert. Similarly, while peccaries are normally active during the day and at dawn and dusk, they are much more nocturnal in Texas and Arizona. At other times, they shelter in whatever cover presents itself, including burrows - something that's particularly important where it gets cold at night, since their bristly coat isn't much use as an insulator. Peccaries in general tend to live in larger herds than pigs, with between five and fifteen animals being typical, but some groups having been reported as including up to fifty individuals. Herds do like to maintain their own specific foraging areas, keeping their distance from one another, although they may share water holes at the edges of their territories. The size of the area used in this way varies significantly, even in relatively similar habitats - anything from 0.5 to 4 square kilometres (130 to 1,000 acres) in the southwestern US, and presumably rather different in, say, Brazil. Males and females are equally common within the herds - there's none of the sexual partitioning seen in many other hoofed animals - which seem to be very stable in structure, with only the occasional male leaving in search of new mates. Life is generally peaceful within the herd, with nursing mothers helping to look after one another's young, and males not bothering to compete for females (which have multiple sexual partners when they're in heat, anyway). There is some evidence that more closely related herd members tend to stay close to another, but this doesn't seem to affect their wider degree of cooperation. If they get annoyed with one another, clacking or displaying their teeth seems sufficient as a warning, rather than escalating to physical violence. Mating takes place throughout the year, and, while females are capable of birthing and suckling up to four young at a time, litter sizes are rarely larger than two. The white-lipped peccary (Tayassu pecari) also inhabits Central America and central and northern South America, but reaches no further north than extreme southern Mexico or much further south than the southern borders of Brazil and Paraguay. This is because it, unlike its relative, lives almost entirely in forest - tropical rainforest, for preference, but almost any kind of woodland will do, or even dry thorn scrub. Physically, it looks very similar to the collared sort, but has thicker fur, with a noticeable mane down the back. It doesn't have the 'collar', but it does have white hair around the mouth and throat, explaining its common name. 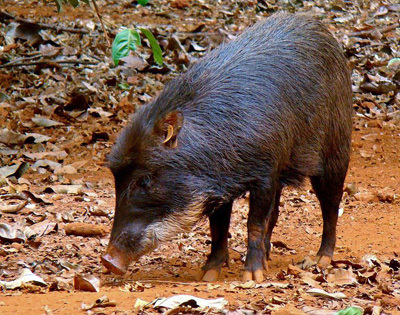 Like the collared peccary, it is usually present in large numbers, and, since the former also live in forests, this means that the two species regularly live side-by-side, especially in Brazil. While their diet is necessarily shaped by what happens to be available in their forest home, white-lipped peccaries, like their collared kin, primarily eat plants of all kinds, with a focus on fruits and seeds, supplemented by insects, small reptiles and amphibians and carrion. Earthworms have been identified as a key source of protein for them, and, where they live close to the sea, some wander down to the beach to eat turtle eggs. It may be significant that white-lipped peccaries have much stronger jaws than the collared sort, allowing them to feed on harder seeds and nuts, so that the two species can share the same forest without either of them starving. Another significant difference between the two species is that white-lipped peccaries live in much larger herds than the already sociable collared peccaries. Herd sizes of thirty or forty individuals are pretty much the lower range and some have literally hundreds of members. Indeed, they likely have the largest herds of any animal that habitually lives in tropical forest (rather than, say, out on the plains). As one might expect, this means that white-lipped peccaries have to travel across a much larger area to keep themselves fed, with estimates reaching around 100 square kilometers (40 square miles) for a herd of 150. There is even some evidence that they migrate to new lands at different times of the year. The herds seem to be less stable in composition than those of collared peccaries, with individuals of both sexes often moving between them in search of new opportunities, even though the herds keep themselves apart where possible. One reason for the large size of their groups may be to help protect against puma and jaguar attacks - this may work, as, where both are found together in equal numbers, jaguars eat more collared than white-lipped peccaries. All of this means that white-lipped peccaries tend to have an even greater effect on the forest environment than collared peccaries do, and they are both major predators and dispersers of seeds. While their powerful jaws and teeth grind up most of the seeds they consume, smaller ones can sometimes survive, and the sheer number of peccaries, and the fact that they tend to travel relatively long distances, make up for the low likelihood of any individual seed surviving digestion. Life within the herd seems to be generally similar to that for collared peccaries. Females mature more quickly than males, and breeding tends to be at least partly seasonal, so that the greatest number of young are born when the trees start to bear fruit. That there are clear differences in the scents that the two sexes produce implies that this, too, has a role in breeding. Interestingly, white-lipped peccaries can actually breed with the collared species, but they have a different number of chromosomes, and the resulting offspring are, like mules, sterile. In 1930, a fossil species of peccary, dating back to the Pleistocene, was discovered and named. There's nothing too unusual about that, because we already knew of a number of other fossil peccaries. What made this one significant though was that, a little over 40 years later... it was discovered alive and well and living in Paraguay. This is the Chacoan peccary (Catagonus wagneri), and it lives in the thorn scrub of the Gran Chaco region at the intersection of Paraguay, Bolivia, and Argentina. With an estimated population of 8,000 or so in the 1990s, and having significantly declined since then, it is formally listed as an endangered species, in danger of becoming genuinely extinct due to hunting pressure and loss of its native habitat. Chacoan peccaries are slightly larger than the other two species, with thick hair and a white marking similar to that of the collared peccary (which helps explain how scientists missed them for so long). A more noticeable anatomic difference is that, unlike the other species, they have only two toes on their hind feet, instead of three, the vestigial "dew claw" having disappeared altogether. It also has fewer chromosomes than the other species (this is probably how it evolved in the first place) and so presumably can't breed with them. Part of the reason that they are endangered is that they seem to have a very narrow habitat tolerance. This means that, while they are still omnivores, the range of food that they eat is relatively restricted - there's not a lot of choice in the thorn scrub. In fact, while they do eat the acacias and so on that make up the scrub, the largest single component of their diet seems to be cacti of various kinds, which are probably also their main source of water. 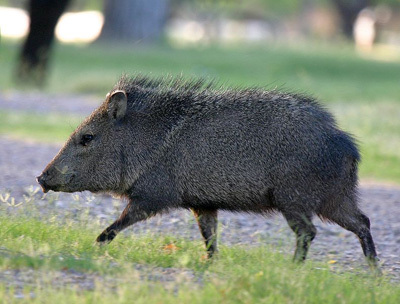 While it's possible that this has something to do with their recent decline in numbers, Chacoan peccaries also tend to live in very small herds - no more than about seven individuals, and, in many cases, just a single mated pair. They only breed once a year, and take two years, rather than one, to reach sexual maturity, which obviously doesn't help them recover that lost population rapidly. Might there, however, be a fourth species that we have somehow also missed? Leaving aside the possibility that the collared peccary might represent two species, which I mentioned above, that was the claim made in 2007. The giant peccary was said to be larger still than the Chacoan species, to have other subtle differences in its appearance, and, perhaps most surprisingly, not to live in herds at all. Genetic evidence suggested that it had diverged from collared peccaries over a million years ago, and that it was clearly a distinct species. In 2011, however, further analysis of the original specimen came to the opposite conclusion, showing that the animal sampled was merely a collared peccary, and not even particularly different from others in the area of Brazil where it had been found. Few now regard it as a distinct species.